X-Cart v.5 and PrestaShop comparison: which one to choose? Nowadays there are a lot of software platforms available for e‑commerce so that any merchant can choose the perfect one just for themselves. Before making such an important decision it’s worth to consider all pros and cons. You can check all the forum discussions about the best e-commerce platform, compare price and quality balance, read hundreds of reviews and so on. But in order to save your time and make your busy life a bit easier we’ve done it for you. X-Cart was founded in 2001, whereas the world knew about Prestashop in 2007. One can’t but agree that experience does count in any matter of life. Both of these companies provide merchants with a downloadable version of software to create their online stores. Prestashop also offers a cloud version. X-Cart offers a hosted package, with this bundle you get the convenience of a cloud eCommerce solution plus an access to the source code for customization of your store. Prestashop is a free shopping cart but you have to pay for all the modules to make your online store up-to-date. In fact, it doesn’t seem so free anymore after all the installations and calculations. X-Cart offers you a 30-day trial free of charge. Afterwards you can buy its lifetime license for some reasonable price with a lot of installed modules included in the out of box option. There are different packages available: Business, Multivendor or Ultimate. Choose the one that suits your online business most of all. These days it’s hard to imagine modern life without a mobile device. Statistics says that over 40% of people use their mobile phones or tablets to surf the Internet. So, X-Cart has taken good care of this side of our daily routine making its design responsive – and also offering a separate mobile skin as an extra option, if you like it.Prestashop features responsive design as well. The free Edition of X-Cart contains everything you need to start selling online. Once you need more tools to increase sales and conversions, you’re welcome to purchase a commercial package “Business” that includes Product comparison, Product Filters, eGoods, Product Variants, User memberships, Discount coupons, Cross-Sale and Up-Sale. Thus you’re getting an entire bundle of modules directly from the software vendor, which guarantees that the modules are mutually compatible and will not break your store once installed. In case of Prestashop, you can buy the modules on Marketplace, but the total cost of them will be way higher – and who knows how they will work with each other? 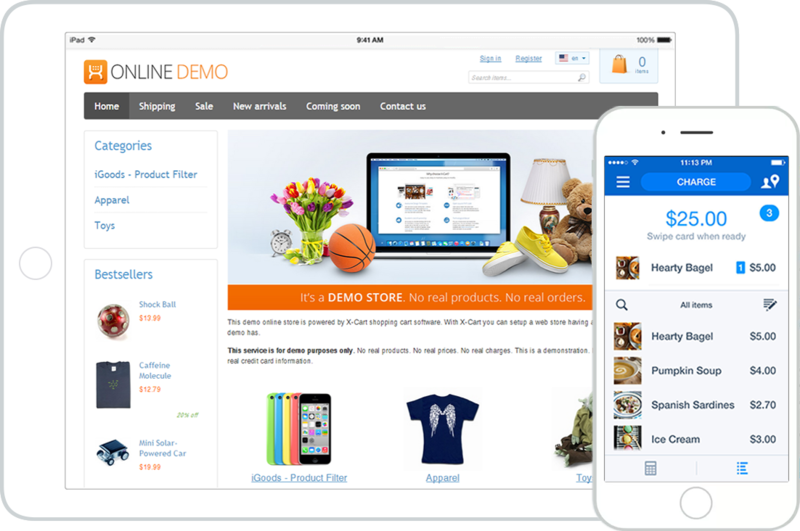 In X-Cart, all the basic functionality you need to sell online is included into a lifetime free edition. Tax calculation, Shipping carriers, Payment gateways integrations – theseare vital features your store can not live without, so they’re included into all packages and do not require extra fee. In case of Prestashop the number of free/ built-in addons of this type is modest, you have to pay to a 3rd party developer up to $100-$250 say, to get an integration with Australia Post or Canada Post. The same about the payment integrations, so the question about the “free” Prestashop solution is raising again – is it really that free as it’s trying to seem? App-store like marketplace in the admin area of X-Cart enables the admin to install the selected module in several clicks. You do not need to patch the files on the server, work with diffs or edit templates. Click “install”- the store will install the module automatically and rebuild cache, and you’re all set to proceed with configuration. Then you’re downloading a module for Prestashop, you will still need to go through all that technical stuff – or hire a specialist and pay to him for the service. Both shopping carts have a full set of legal SEO tools most of which come with their downloadable versions and some need to be purchased in the marketplace. The main features that help your store rank high with various search engines are clean URLs, meta data, page titles, Rich Google snippets, XML sitemap and so on. Social sharing buttons allow you to expand your business into the social media pages and gather more visitors to your website page. X-Cart has a number of modules to make your store more available and accessible to people around the globe, for example, Social login, VKComments, Social Tabs, Go Social, etc. Become closer to your customers and your sales will be boosted! X-Cart has a big advantage over Prestashop due to its Multi-Vendor package. This is a unique solution for an online marketplace with several merchants sharing the same online store. Each vendor can manage their own products, orders, sales without interrupting the work of others or being disturbed by them. Each merchant has an access only to their part of the store. Both, X-Cart and Prestashop, are customer-friendly and one can find all the necessary information about their products and the latest updates on their websites, including the detailed installation guide with video demonstrations. X-Cart has its own Knowledge Base where you can find all the answers to your questions about X-Cart’s product. In case one still has any questions or problems with the software the friendly support teams are always ready to assist all the merchants. X-Cart has a very important advantage of Live Chat available. As far as one can see, these two platforms are worthy to be checked out, but X-Cart has some significant advantages over its rival.